Costumes and the typical traditions of Carnival in the Basque Country have reached Quebec this year thanks to Euskaldunak. 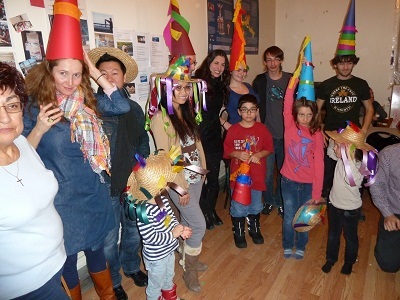 On February 11th the Basque club, headquartered in Montreal, organized a festival with participants creating their costumes and hats typical of carnival in some parts of the Basque Country. After, Adelaide Daraspe, club president, gave a talk which delved in to the rich tradition of Carnival in Basque culture. Montreal, Quebec. The Euskaldunak of Quebec Basque club celebrated Carnival on February 11th with a party that took place at the clubhouse in Montreal. The festivities gathered around 30 members, children and adults, who started to work at 5pm creating their costumes and Carnival hats during a workshop offered by the club. The hats were reproductions of those worn in some villages in the Basque Country during Carnival. Following the workshop, members enjoyed a light supper that included typical dishes eaten during Carnival: mahatamiak. In some places in Iparralde these crepes are given to those who walk the streets in costume during Carnival, and Ernest Behaxateguy, club member, gave a very fun demonstration on how to prepare them. After regaining their strength, club members had the chance to learn more about Carnival in the Basque Country, thanks to club president, Adelaide Daraspe, who gave a talk on the subject. “It was a really nice day and we are already planning to do more activities for our children because they bring so much life and color to the Basque club,” Daraspe said.